Free Shipping Included! Montague Metal Products 32-Inch Weathervane with Color Horse Ornament by Montague Metal Products at List It Fort Worth. MPN: WV-274-NC. Hurry! Limited time offer. Offer valid only while supplies last. 32'' cast aluminum weathervane. The mast, directional letters and arrow are finished with a baked on satin black enamel finish for extra durability. 32" cast aluminum weathervane. The mast, directional letters and arrow are finished with a baked on satin black enamel finish for extra durability. 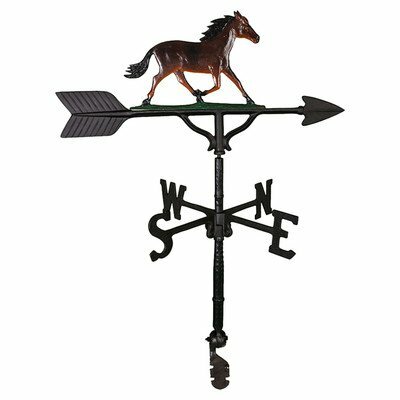 This weathervane is recommended for use on a 24" - 30" cupola, two car garage or medium size home. If you have any questions about this product by Montague Metal Products, contact us by completing and submitting the form below. If you are looking for a specif part number, please include it with your message.